In an effort to highlight places of interest in countries across the world, their varied culture, economy and history, The Statesman brings to you a Weekly Focus on countries with which India shares diplomatic ties and friendship. This week’s focus is on Romania. Know all about the country. Romanian cuisine is an eclectic mix of different cultural influences, with elements from Turkey, Germany and Hungary all easily discernible. Traditionally, Romanian food tends to be stodgy and meat-based, revolving around dishes such as Ciolan afumat, Mamaliga and Carnati de plescoi. Breakfast almost always includes eggs, either soft-boiled, hard-boiled, fried or scrambled and omelettes filled with either cheese, ham or mushrooms are also frequently served. The highlight of a traditional Romanian restaurant meal is usually the appetiser dish, most likely a bowl of sour soup called ciorba. Pork is the main meat used in Romanian cuisine while cabbage is a culinary favourite and is often used in soups and salads. Some of the specialities include Sarmale, Tochitura, Pârjoale, Amandine, Tuica and Turt. The best times to visit in terms of climate are the end of April to the beginning of July and from end of August to the end of October as temperatures are mild and pleasant. Summers can be hot, especially in Southern Romania, including Bucharest, but along the Black Sea Coast, sea breezes lead to moderate temperatures. Snow falls throughout most of the country during winter. The Indian community in Romania numbers around 950. The majority are students (nearly 250 Indian students attend courses in Romania institutions, mainly pursuing medicine on a self-financing basis). Others are businessmen, professionals and technical specialists. There are four Indian restaurants in Bucharest, one in Timisoara and one in Galati. Occasions such as New Year’s Day, Labour Day, Independence Day (23 and 24 August), and the National Day of Romania (1 December) are celebrated. Different regions have traditions of spring and summer festivals, including the Pageant of the Juni in the city of Brasov, which is celebrated with parades, and Sinzienele, which is observed throughout the country near the time of the summer solstice. Bilateral institutional mechanisms to promote trade and economic cooperation emanate from the Joint Economic Committee at the government level. Following the worldwide recession, there was a decline in bilateral trade in 2009-10, from which it has been recovering slowly. However, there exists considerable potential for increase in the bilateral trade, which is hovering around US$ 600-800 mn mark. Main Indian exports to Romania include electric machines, devices and equipment, common metals, chemical and allied industries products, plastic and rubber materials, textiles, food products, beverages and tobacco, vegetable products, paper and cardboard and its scrap, articles made of stone, cement, ceramics, glass and optical photographic, cinematographic, medical instruments and devices. Main Indian imports from Romania are vehicles (other than railway carriages or tramway) and parts thereof, iron and steel, organic chemicals, inorganic chemicals, rubber or plastic and articles thereof. Specific sectors/products that have been identified for focus are pharmaceuticals, including nutraceuticals and nature-based medicines and medical devices, agriculture and agricultural products and devices, automotives and parts thereof, engineering goods, iron and steel, chemicals and rubber. 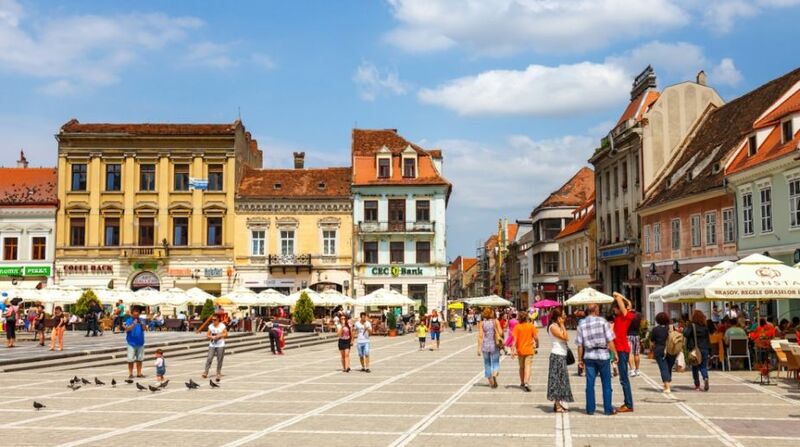 own a number of medium-sized establishments in electronics, textiles, trading, restaurants, real estate and construction, handicrafts, yoga and wellness centres in Romania. Romania ranks 81st in terms of FDI inflows into India. Romanian companies such as Altantia SPA, Saira Seats SAS, Simest SPA, Summer Conf SRL, Hanna Instruments Romania SRL and Omnia Profesuional SRL, have all invested in India. The short-stay visa for tourism purposes (marked C/TU) is issued for travel to Romania for tourism. Supporting documents are passport valid at least three months beyond intended period of stay, ID card copy, 2 recent colour photos, visa application form, letter of certification of employment, booking of a two-way flight ticket to Romania, medical insurance valid in Romania (covering one day beyond the intended period of stay and of a value not less than 50,000 EUR (original and copy), proof of financial means (an amount of EUR 50/day for the entire period, but not less than EUR 500 or the equivalent in convertible currency) and proof of accommodation. Visa fee is the equivalent in Rupees of 60 EUR. Bucharest: In terms of culture and nightlife, Bucharest has a lot going on, boasting fascinating museums, theatres and opera houses. For culture and history buffs, Bucharest boasts a tremendous range of museums to choose from, including the National Museum of Contemporary Art (in the Parliament Palace), Grigore Antipa Natural History Museum, as well as the captivating Museum of the Romanian Peasant and the Village Museum (Europe’s largest outdoor museum). In terms of entertainment, the world-famous Romanian Athenaeum offers wonderful concerts performed by George Enescu Philharmonic, while the charming Lipscani district in Bucharest Old Town entices visitors with its vibrant mix of art galleries, hip cafés and antique shops that line the narrow cobblestone streets. The Danube Delta: A UNESCO Natural World Heritage Site and one of the most unique places in Romania, the Danube Delta is teeming with an amazing variety of flora and fauna that’s unique in Europe, and maybe the world. It boasts no less than 23 natural ecosystems and 3,450 animal species, including 300 types of birds. The Painted Monasteries of Bucovina: Situated in northeastern Romania, the Painted Monasteries of Bucovina consists of a stunning collection of Byzantine jewels adorned with exquisite 15th and 16th-century frescoes that depict scenes from the Old and New Testaments. Due to their uniqueness, authenticity, exceptional artistic value and gorgeous surroundings, most of them have been included in the UNESCO World Heritage List as masterpieces of mural art. Among the best preserved are Sucevita, Probota, Patrauti, Moldovita, Humor, Arbore, the Church of St George and the Monastery of Voronet, famous worldwide for its inimitable shade of blue (Voronet Blue). The Town of Sighisoara, Dracula’s Castle (Bran Castle), Cluj-Napoca, Sibiu, Brasov and Sinaia.